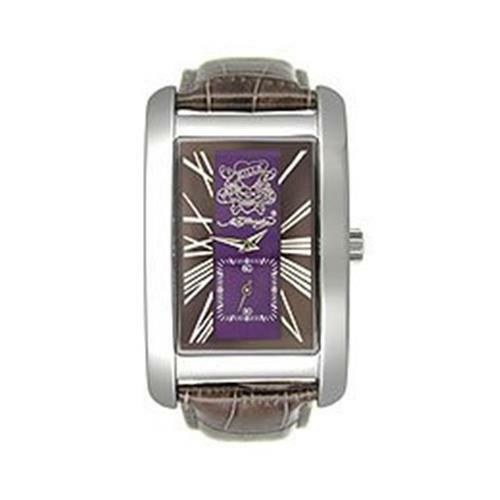 Men with a taste for edgy, daring style should look no further than the Ed Hardy Men's Brute Watch. This unique timepiece has been decorated with tattoos images that were carefully selected from Ed Hardy's extensive collection. A white tiger-face tattoo has been imprinted at the center of the dial and attractively contrasts the dial face. The dial also features a unique index layout, which contains both Arabic numerals and exotic, tattoo-inspired symbols. Protected by a scratch-resistant mineral crystal, the dial also contains luminous arrow hands and a date window perched above six o'clock. The stainless steel watch band has been coated in a deep black finish and closes in a comfortable deployment clasp. This watch is water resistant to 330 feet (100 meters) and boasts reliable quartz movement. It is presented in a tattoo-emblazoned gift box.